I’m helping myself to Li’s last glass ( silicon x mug) of Georgian wine. I bought the essential nectar sold in an old plastic litre soft drink bottle while Li was busying herself with filling up on water. As i write this Li has fallen asleep and no doubt we can’t carry the wine tomorrow! 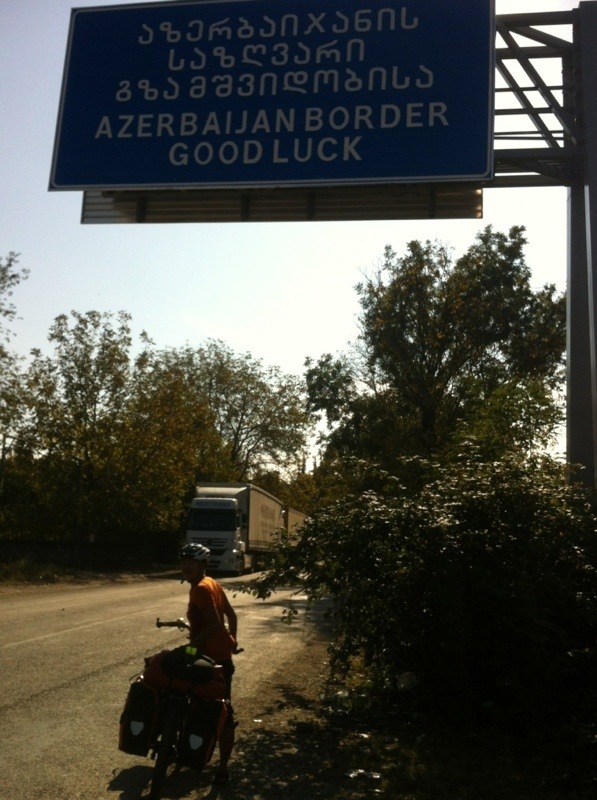 Within a few kilometres we will cross borders from Georgia into Azerbaijan. Leaving Tbilisi was far easier than expected. I was dreading hopping back on the bicycle and negotiating the chaos of Georgian driving. After ten days of rest, waiting for visas, visiting bath houses, making new friends, tasting the city’s delights…….and as a pedestrian….becoming terrified of crossing a road….we set off. The roads, the driving, it was doable, a wee amount of adrenaline, but doable….almost easy. We were soon out of the city limits. 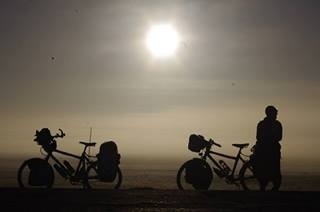 Fresh legs…..heavy legs….damn…..have we lost our cycling mojo? The second day the scenery improved and our spirits rose with the gently rising landscape…..but Li was having trouble with her sit bones, hips, and again her elbow, eventually pain becoming excruciating. Numerous stops to adjust saddle. We found a perfect place to camp, reds, oranges of Autumn, villages, mist and vineyards below. Over 200 days since our departure and something continues to be sublime in every day. Ok….perfect view….a Valium to abate the spasms, great camp cooked food, sleep and another day. Snow capped mountains, The Greater Caucausus……..inspiring……I am disbelieving….all day they beckon to us and only gentle climbs and descents, chilly descents. But it’s 29 degrees, sun screen and back into shorts and tees. A beautiful ride, villages full of fresh produce, wine….all road side stalls and far better to traverse by bicycle than motorised vehicle. This is really, really, life, a life to be lived, explored. But between us…. Hips, elbow, knees hurt….I bonk (hit the wall to all you non-cyclist readers)…..first time in months. No reason as we should be fit, rested …. 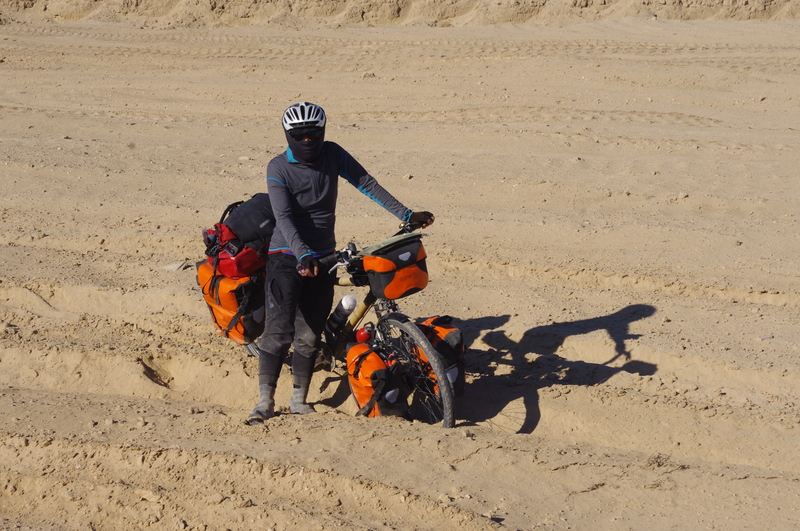 This is hard…..the roads, rather bumpy, poor condition, but comparably easy to previous terrain. We are so very close to the border, also a national park….but our bodies won’t allow us to go further. In Georgia camping has never been a problem….we ask several times….but are directed onwards. It will soon be dark. Ok I have great wine…..lets book into a hotel….2 kilometres to the park now a kilometre is too much of an obstacle. The hotel doesn’t have much water….but heating….we pump to the max. Nights have become cold, will become only colder and we will live up tonight, me with Li’s share of wine, Li, warm, snoring, under the sweet smelling bed covers, and tomorrow we enter Azerbaijan, more excitement and more of the unknown. 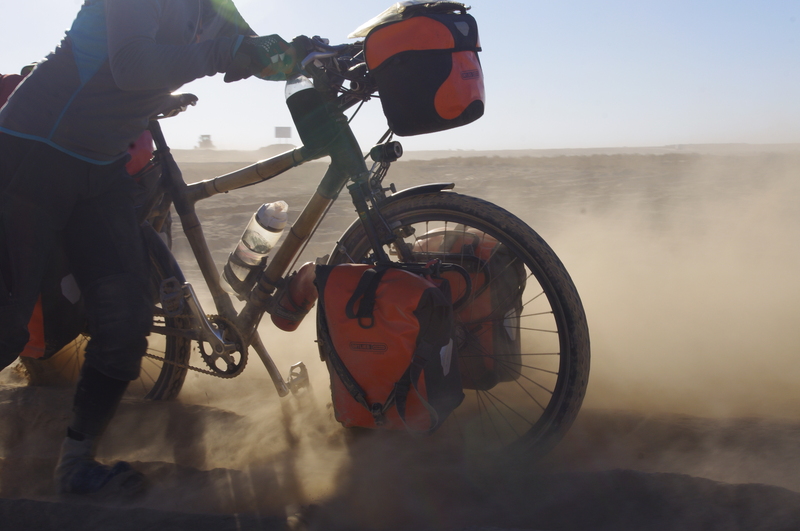 2 Responses to "Tbilisi to Lagodekhi, Final Days in Georgia"